click for larger view or download from the link above! 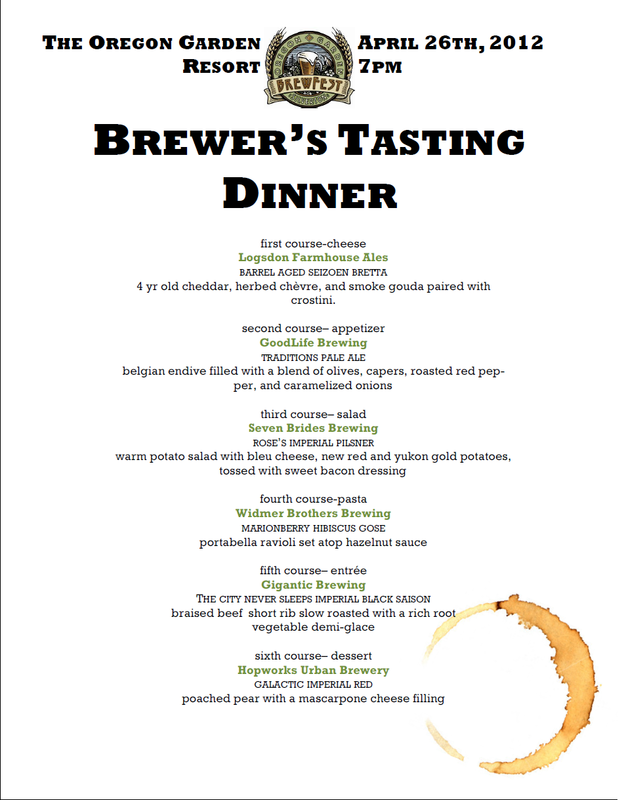 Join us on Brewfest eve, April 26th 2012 at 7pm in the beautiful Oregon Garden Resort for a 6 course Brewer's Tasting Dinner. We've invited the brewers and reps participating in the fest, beer bloggers and beer-focused media. There are a limited number of tickets available to the public. Each course will be a small plate paired with a beer tasting from one of the breweries below. The brewers will take a few minutes to talk to us about each of the beers. After dinner, head into the Fireside Lounge to mingle with the featured brewers and redeem your dinner ticket for drink and food specials at the bar. Safety First. Make a night of it and stay at the Resort. 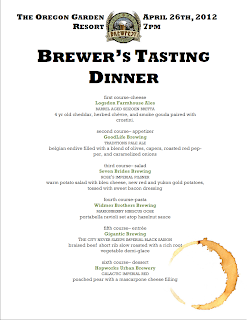 The Resort is offering a Brewer's Dinner package for $199 which includes your room on Thursday night, two tickets to the dinner, breakfast Friday morning, two admissions to Brewfest (two tasting glasses and 10 tasting tickets), and food vouchers for the fest. If you already bought your tickets- we are also offering a $139 Brewfest package which includes your room, breakfast Friday morning, two entries to the Brewfest for Friday and food vouchers for the fest. The Brewfest opens at Noon on Friday with a Connoisseur tasting until 2pm during which reps and brewers will be available to talk shop. Call 503-874-2500 to make your reservations.